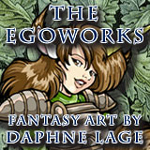 THE EGOWORKS is a United States-based studio that features the fantasy artwork and comic book work by Daphne Lage and also maintains and updates all the websites associated with this domain. and all related sub-domains, including any content, functionality and services offered on or through (the “Website“), whether as a guest or a registered user. When you access the Website, the Company will learn certain information about you during your visit. We use information you provide to us to deliver the requested product and/or service, to improve our overall performance, and to provide you with offers, promotions, and information. If you are outside the European Union and opt to receive any free resources, or purchase any products sold by the Company on this Website, we will automatically enroll ​you to receive our free email newsletter. If you do not wish to receive this newsletter, you can unsubscribe anytime. We include an “unsubscribe” link at the bottom of every email we send. If you ever have trouble unsubscribing, you can send an email to egoraven@egoworks.com requesting to unsubscribe from future emails. If you are in the European Union and opt to receive any free resources, or purchase any products sold by the Company on this Website, we will only enroll ​you to receive our free email newsletter if you affirmatively consent to it. If you do not wish to receive this newsletter, you can unsubscribe anytime. We include an “unsubscribe” link at the bottom of every email we send. If you ever have trouble unsubscribing, you can send an email to egoraven@egoworks.com requesting to unsubscribe from future emails. Provided your request is reasonable and there is no legal basis for us to retain it, then at our discretion we may agree to your request to delete personal information that you have posted. You can make a request by contacting us at egoraven@egoworks.com. © The Egoworks 2018. All rights reserved. Join me on YouTube where I currently have over 100+ videos ranging from art demos, time lapses, and even unboxings and Disney hauls! 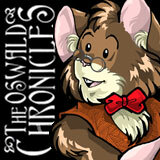 Don’t forget to Subscribe, Like, and Share! Join me on PATREON where I’m currently finishing up on ISSUE TWO of TALL TAILS: Tears of the Mother!